"Alan Lee and John Howe, these guys are integral for us to map out that progress in the two movies, and allow you to completely blend in to the universe that is already in place." It was soon obvious to me that John Howe would become the lead designer of Smaug the dragon and Alan Lee would ensure that the movie of The Hobbit would match in look & feel with Peter Jackson's Lord of the Rings. John Howe then released his wonderful book forging dragons in October 2008. This title presented the entire collection of John Howe's dragon art, created over his 30-year career, in one breathtaking volume. It presented a personal exploration by John of the inspirations and techniques he uses to render these amazing beasts. Each dragon is gloriously presented on a double page spread; accompanying this is a series of pages where John reveals how he forged each one through working sketches and reference material. From fire dragons erupting from molten depths, through sea dragons churning stormy seas, every medieval, celtic, gothic and sci-fi icon is represented. Fascinating text reveals the myths behind each dragon, as well as an exploration on its render, with full captions, annotations, highlighted details and design elements. Wonderful to see was that the forward was by no one less then Guillermo Del Toro! Not much later John Howe moved over to New-Zealand, just like for The Lord of the Rings, he and Alan Lee were one of the first to arrive on the scene to start working on the movie. There was a bit of a radio silence after that and in June of this year the first rumors came out that John Howe was working at WETA on Middle-earth related sculptures. For those who went to Saint-Ursanne in 2007, we know John likes to make sculptures and it was soon clear that he wanted to go further and step up some levels. On his first-ever foray into three-dimensional representations of his world renowned Tolkien portfolio he picked Weta as his partner. Together with his friend and Weta Workshop's Creative Director, Richard Taylor, he started to fullfill his dream of adding an extra dimension to his work of art. Guided by John's and Richard's watchful eyes, a series of incredible sculpture has been created by Daniel Cockersell, Brigitte Wuest, Eden Small and the team at Weta Workshop. Cast in very short editions in bronze and in white metal, these fine art pieces will be cherished by discerning collectors the world over. "I think one of the designs I'm the proudest of is Smaug. Obviously he took the longest. It's actually still active: we're finishing his colour palette and a little bit of the texture. But the bulk of the design took about a year, solid. It's because of the unique features of the dragon. Early in production I came up with a very strong idea that would separate Smaug from every other dragon ever made. The problem was implementing that idea. But I think we've nailed it." For sure Smaug will be majestic and able to talk, and not be a dragon like we saw in Reign of Fire. Since we know in May they were already designing about one year, and John Howe was there, we can presume all work done so far has connections with the movies... in fact I should write John Howe and ask! In the mean time enjoy his art for one more time, this time not as illustration, but as illustration that came to life! The Art of John Howe - Sculptures from Middle-earth™ is a series of sculptures from John's iconic representations of Tolkien's worlds, sculpted by Weta sculptors Daniel Cockersell, Brigitte Wuest and Eden Small under the creative guidance of John Howe and Richard Taylor. Here are the first two statues both available in bronze (20 pieces worldwide ) or in faux-bronze (300 pieces worldwide). Once more are available, I'll add them to this page. 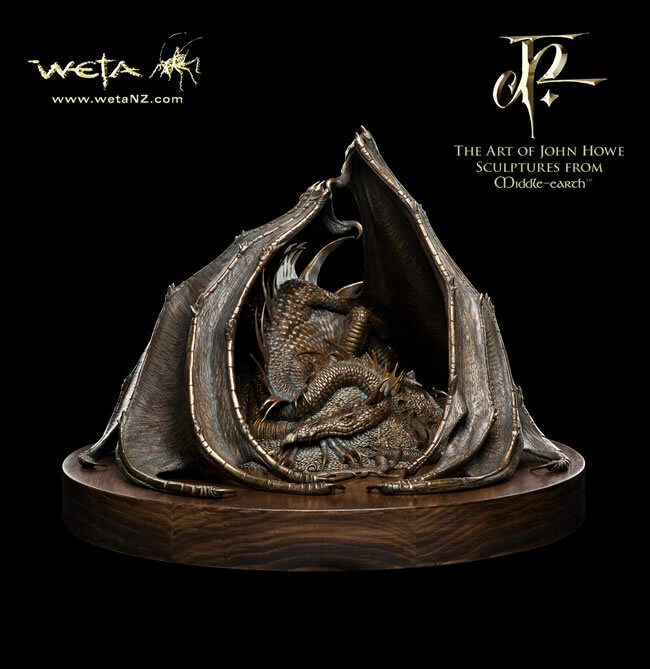 Smaug™ the Golden is the first sculpture in John Howe's and Weta's range of sculptures from Middle-earth™. The sculpture is based on John's original artwork created in 1990. It was first published on the cover of the paperback edition of The Hobbit by Grafton Books in 1991. Having adorned the cover of The Hobbit, it is an instantly recognisable image to old and young Tolkien fans alike. Smaug - the great dragon, at one with his cache and jealously guarding it against the world around him. Éowyn and the Nazgûl™ is the second sculpture in our range of The Art of John Howe. 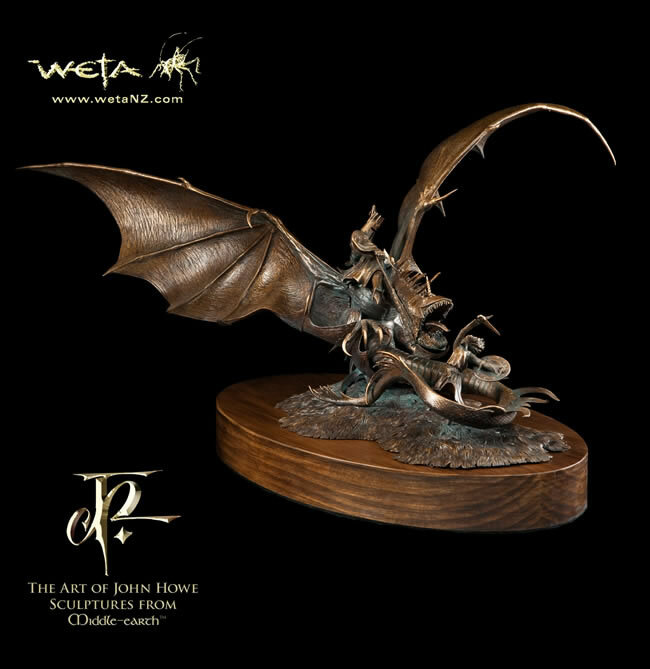 The sculpture is based on John's original artwork originally done for the 1991 Tolkien Calendar. This is a painting John has long wanted to see become a sculpture. Fair but fierce, Éowyn's rage and terror is clear to see as she prepares to slay the fell-beast and its rider, the Lord of the Nazgûl. The original painting was stolen in 1997 from the Médiathèque of Sedan in France, along with "Gandalf the Grey" and "the Uruk-hai". Like them, it was never recovered. This is a rare opportunity to own this iconic and dynamic piece. Having seen the beautiful, but expensive art by John Howe - let us end with something nice we can all enjoy and afford! 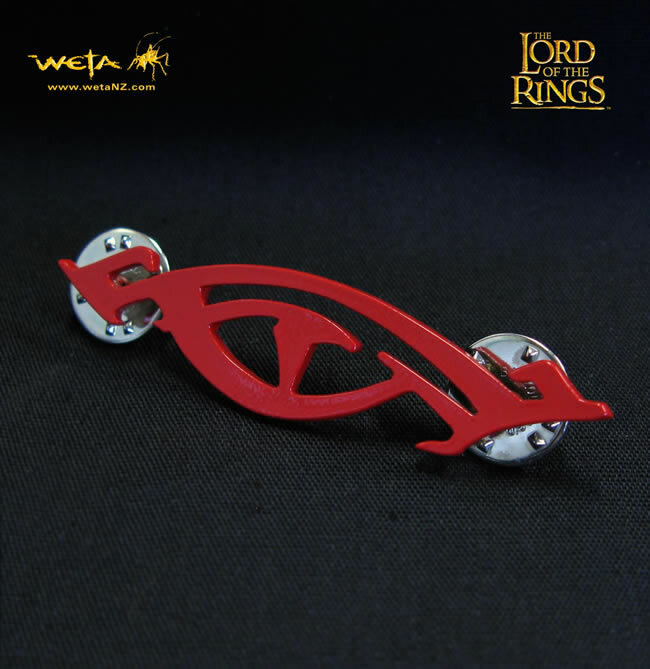 Designed by John Howe for Weta Workshop's crew clothing, the Red Eye of Sauron became an unofficial emblem for Weta during the filming of the trilogy. When in need of a Weta technician, the film crew and cast would look for the symbol of the Red Eye. Now you too can feel like part of the Weta Crew. Nickel plated and and painted blood red, this is a striking design - classic John Howe. On the back are two pins with fasteners. It comes pinned to a Lord of the Rings card, and sealed for protection in a plastic bag.